Dr. Akella specializes in the control of complex dynamical systems that are subject to large scale nonlinearities and uncertainties. 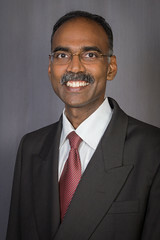 He has served on the Cockrell School of Engineering faculty since 1999. Dr. Akella directs the Controls Lab for Distributed and Uncertain Systems (C-DUS) with the ASE/EM Department at UT Austin. He is affiliated with the Center for Space Research and has also engaged in active collaborations with the Wireless Networking and Communications Group and the Center for Aeromechanics Research. Dr. Akella’s current research encompasses control theoretic investigations and experimental validation of a wide variety of complex engineered dynamical systems that include autonomous space vehicles and mobile robots; flow-control systems for high-speed and hypersonic vehicles; miniature robots navigating inside GPS denied environments; uncertainty quantification; and cooperative control and collaborative sensing problems in swarm robots. His theoretical contributions have found several highly successful applications in astrodynamics and in the control of space systems and vision-guided robotics. For his far-reaching theoretical contributions and practical advances in aircraft/spacecraft guidance, navigation and control, particularly nonlinear attitude estimation and control, Dr. Akella received several prestigious awards including the 2013 Mechanics and Control of Flight Award from the American Institute of Aeronautics and Astronautics (AIAA) and the 2015 Judith A. Resnik Space Award from the IEEE Aerospace and Electronic Systems Society. He is a Fellow of the American Astronautical Society (AAS), an Associate Fellow of the AIAA, and an IEEE Senior Member. He currently serves as Associate Editor for the Journal of Guidance, Control, and Dynamics (JGCD), the Journal of the Astronautical Sciences (JAS), and the IEEE Transactions on Aerospace and Electronic Systems (T-AES). He has published more than 120 research papers in peer-reviewed archival journals and conference proceedings.